You’re ready to make your first big purchase, the purchase that will define you as an adult and pave the way to long-term financial health. You could be buying a starter home, investing in stock, or getting your first investment property. Before you do, make sure your credit is in order. Surprisingly, the hard-and-fast financial rules you may have followed to get yourself out of debt do not necessarily apply when you are trying to boost your credit score. When determining your credit score, FICO (the Fair Isaac Corporation) weighs different elements of your credit report in different ways. By understanding how FICO balances those elements, you can boost your score and increase your likelihood of being able to move ahead with your next big purchase. Nearly a third of your credit score is based on your credit utilization rate, according to Investopedia.com. This is the percentage of debt you have compared to the amount of credit you have available. If you are trying to get out of debt, your financial advisor may have told you to pay off your credit obligations with the highest interest rates first. This is sound advice for someone who is trying to get out of debt, but it is not as applicable if you are trying to boost your credit score. When trying to boost your credit score, you should pay off the accounts that are closest to their limits first. As you pay down these accounts, your credit utilization percentage will lower itself, and your credit score will increase. Everyone forgets or ignores the occasional bill, especially when they have other financial obligations. But if you are trying to boost your credit score, avoid doing this. Your fine to the library may not seem important, but most local libraries will send unpaid fines plus a handling fee to collection agencies. Your $20 fine for losing a DVD or the book you forgot to return can easily become a $50 collection notice that brings down your credit score. Unpaid medical bills, back taxes and even improperly canceled gym memberships can have a similar effect on your credit report. 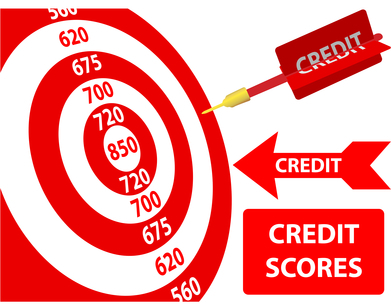 It is critical to keep on eye on your loose ends, as they have the potential to unravel your credit score. Equally important is keeping an eye on what others may be doing to your score. A stranger or even an ill-intentioned relative could easily steal your info to open a line of credit, or they could forget to pay a bill that is in your name. A credit protection service can help you to avoid these sorts of mishaps, but before signing up for one, compare plans—there are many different ones with varying protection levels on the market. The types of credit you have also impact your credit score. Credit cards, for example, are not viewed as favorably as a mortgage, and store credit cards are viewed as even worse. It is almost impossible to buy anything anywhere without having the cashier ask if you would like to save 10 percent by opening a store card. Although it may be tempting to save a few dollars or even buy a few extra things on your new line of credit, decline these offers. If you are accepted for their credit offers, it will increase the amount of debt on your credit report and thus negatively impact your debt-to-income ratio. These lenders are also considered as “lenders of last resort” by the credit reporting agencies, and having a financial relationship with them is rarely a positive thing. Guillermo DiMaria is an Italian transplant who moved to the U.S. to study finance and sustainability.